Between Land and Sea by Lin Gregory represents a journey along the East Sussex coast, capturing the landmarks that occupy the space where the land meets the sea. 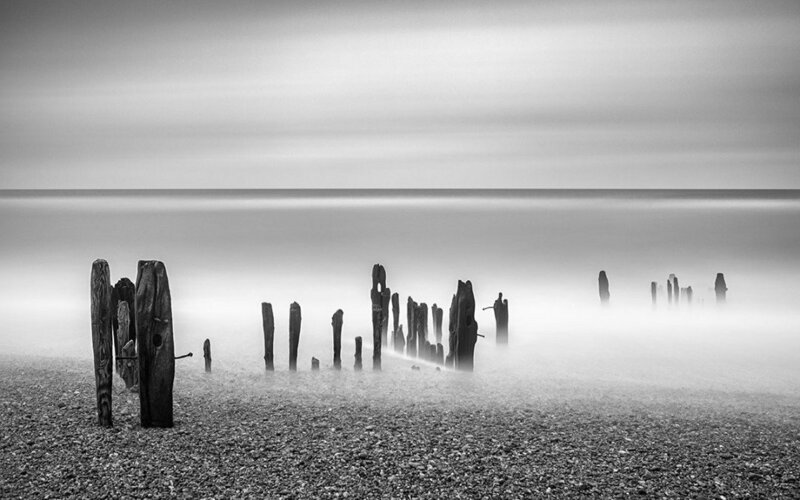 “I use slow photography to record the interaction between the land and the sea to convey the sense of tranquillity I experience walking in this landscape and evoke a feeling for the solidity yet impermanence of our coastline, both natural and manmade. The seed of this project first came to me in 2010 after Hastings Pier was the subject of an arson attack that threatened its existence. As a local photographer I see the pier as a focal point when walking along the seafront. Yet, after the fire, the possibility of there being an empty space where the remains of the pier stood led me to document the place between land and sea, capturing the many structures along the ever-changing coast before they too are destroyed or reshaped by the sea. This exhibition is made up of 28 framed black and white fine art photographs printed on archival paper. Further information from Lin Gregory’s website.